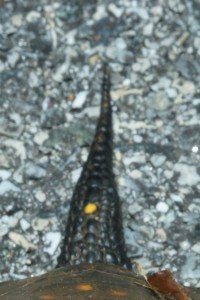 While I was driving on Wildlife Loop on the North Tract today, I saw a small black object in the road. At first, I thought it was a piece of debris, but on closer examination it was a Spotted Turtle (Clemmys guttata). I drove around the turtle and got out of my Jeep to take these pictures. 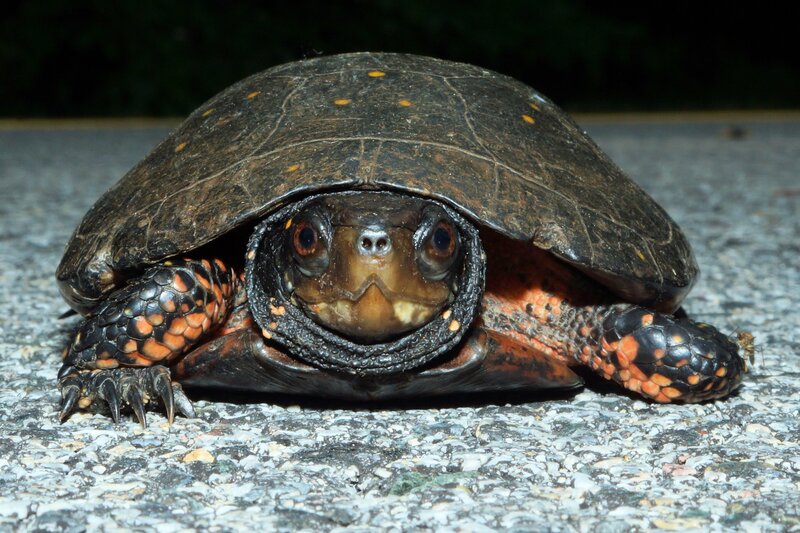 Spotted turtles are found in North America from Ontario and the Great Lakes region in the USA and in Atlantic Coastal States, mostly east of the Appalachians. This one is a male. Male Spotted Turtles have a tan chin, brown eyes, and a long, thick tail. The females’ chin is orange; she also has orange eyes and a shorter tail than the male. Also male Spotted Turtles‘ bottom shell is concave, while the females’ are flat or convex. 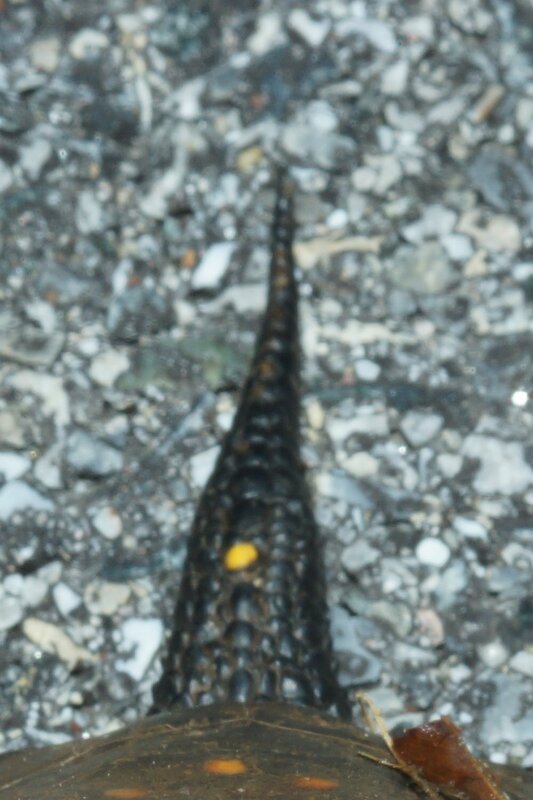 The eyes on this guy look orangish probably due to the flash I used. 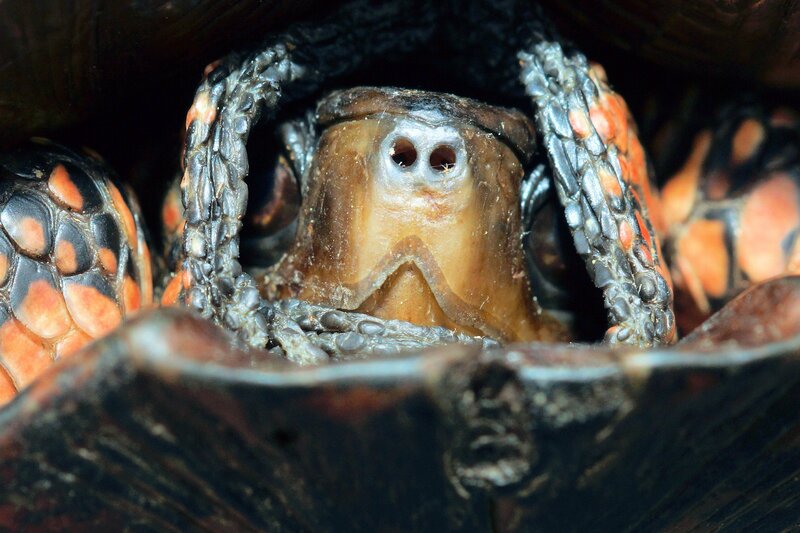 However, he was definitely a male because his bottom shell was concave and because his chin is light colored. 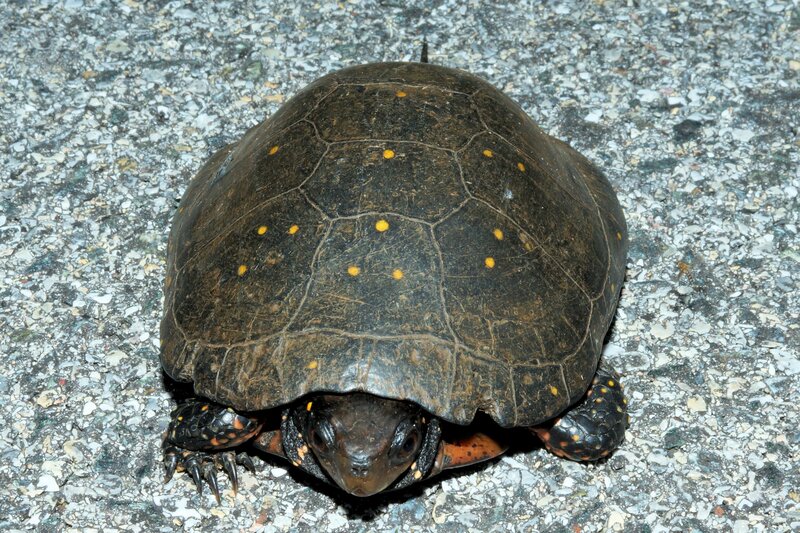 The Spotted Turtle prefers wetland habitats, such as swamps, bogs, fens, marshes, woodland streams, and wet pastures. That is why it was interesting seeing him trying to cross the road. The wet weather we have had this spring could explain this. The Spotted Turtle is federally endangered in Canada, but not yet listed as endangered in the USA under the Federal Endangered Species Act. However, the International Union for Conservation of Nature (IUCN) lists this species as vulnerable to extinction. 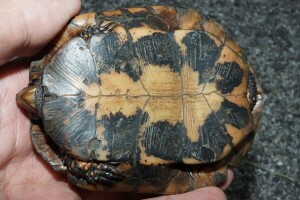 It is listed as endangered in Indiana. This entry was posted in Fauna, Journal. Bookmark the permalink.